Georgia has a unique tradition of polyphonic choral singing. Georgian traditional polyphony (music consisting of two or more related melodic lines) is not the result of any effort to create arrangements for the concert stage. On the contrary, it is the result of a creative process believed to have sprouted naturally and autonomously from the Georgian people before the Middle Ages, well before polyphony was used anywhere else in Europe. It has continued to develop orally from generation to generation and represents something very different from the traditional music of its neighbours, which has remained primarily monophonic (music in which melodic interest is confined to one line). 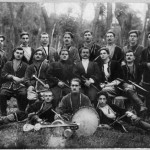 Traces of archaism, which defy the conventions of harmony, counterpoint, and voice leading, are still present in Georgian folk music, and at times make the music seem very modern. Songs are predominantly sung in three-part harmony, in which all parts are of equal importance. The sonic result thus places more importance on the harmony than the melodic line. The folk music of Georgia is as widely varied as the geographical areas from which it sprang, and ranges from the intricate melismatic singing style of the east to the fierce, dissonant, and complex counterpoint of the west. Due to urbanization and displaced populations, however, Georgia’s traditional music in the rural regions is being threatened. With the help of NGOs, UNESCO, and a vibrant traditional musical scene in the capital city of Tbilisi, efforts are being made to reinvigorate the rural musical practices. The traditional songs of Georgia are rooted in a bygone lifestyle of the country’s rural people. Work songs, healing songs, dance songs, lullabies, travelling songs, wedding songs, Christmas and Easter songs, historical songs, etc. were all an intrinsic part of everyday living. Now, however, because of great technological and political/administrative changes that have occurred in Georgia and throughout the world, many of these songs have lost their original meaning. For instance, work songs, whose rhythmic qualities improved productivity, have fallen into disuse today. But the songs have not entirely disappeared. Liturgical songs are once again sung freely in churches, and a vast range of Georgian traditional music can be heard on the concert stage, and also at the lavish Georgian banquets called supra. If one is describing Georgian culture, attention must surely be given to the traditional Georgian supra. At first glance it would be described as a banquet at which there is much food, wine, toasting, and singing. However, this does not describe the spiritual side of a supra. Whenever space allows, the supra is always held at one long table, or a makeshift table of many joined together end to end, running from one room to another, if need be. The table is laden with wine jugs which are always kept full of excellent Georgian wine, and copious amounts of food of all kinds, so much so that the table surface almost disappears. Each supra has a tamada (the closest English translation is “toastmaster”) and is chosen by the host of the supra before the supra begins. Fulfilling one’s role as a tamada is an art form in itself. A good tamada is a poet/wit/philosopher/social commentator/orator/singer who creatively improvises a beautiful atmosphere of community, camaraderie and love through his toasts which introduce periods of tranquility and reflection amidst the extroverted energy of table conversation. Through an adroit choice of songs which are sung after every toast, the message of each toast is given more resonance. The order in which the toasts are given is important. Throughout most of Georgia, the first toast is always to peace, followed by a toast to parents, to brothers and sisters, to those who have passed away (especially to any friend or relative of any person present at the table), to life (especially to the lives of the children of those who have recently passed away), and then to love and friendship. After all these toasts have been made in this order, the tamada is free to choose his own additional topics, maintaining the established creative flow, usually relating these toasts to the people present or to the occasion which prompted the supra. The topics, to name a few, might be to ancestors, to mothers, to beauty, to creativity, to absent friends who are far away, etc. After any of the evening’s toasts, a guest, with the permission of the tamada, can add some thoughts of his or her own with another toast on the same topic. Starting a new topic without the tamada’s permission would be a social blunder. One important rule of the supra is that there should be no negative remarks or toasts, and it is the responsibility of the tamada to ensure that this rule is observed. Another rule of the supra is that one must not be drinking one’s wine unless a toast has just been made, and so it is the tamada’s responsibility to space out the toasts accordingly, so that everyone has a chance to imbibe, but not so often that people might become too intoxicated. In the hands of a good tamada, a supra is a beautiful, moving experience. This entry was posted on Sunday, March 1st, 2015 at 12:01 am	and is filed under Folk, Georgian Music, History. You can follow any responses to this entry through the RSS 2.0 feed. Both comments and pings are currently closed.